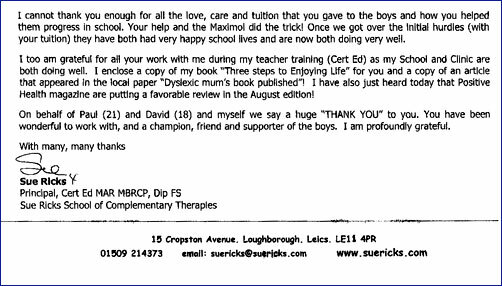 This extract is from a letter received from a grateful parent who came to the Learn-Write Centre and went on to become a well-known therapist in her field and a successful writer. Many parents coming to the Centre identify with their child, that they too, have experienced similar physical and functional difficulties during their education. At the initial assessment at the Centre, other student's 'Before' and 'After,' results are shown to parents and children who have dyslexia and dysgraphia, to help them gain an understanding of why and how these disorders iinhibit a development of a writing speed, writing accuracy, spelling, and an ability to work at length in written English. They can look at similar handwriting styles and see how well and how quickly others with a similar writing style to their own, have improved. All the teaching treatments offered at the Centre are carried out on an individual basis and are all prescriptive. It is so satisfying to hear that the Learn-Write Centre has made a difference to people's lives and their opportunities.